The question of 'what the greatest action movie of all time is' typically boils down to two very simple, but beloved words: Die Hard. Then the conversation generally turns into slobbering over Die Hard and how great and perfect it is. But one of the more interesting Hollywood legends claims that Die Hard actually started out as a sequel to Arnold Schwarzenegger's Commando. So is there any truth to it? Screenwriter Steven de Souza has finally settled it once and for all. During a recent interview with Bristol Bad Film Club, Steven de Souza, who wrote the initial draft of Commando 2 (which ultimately never got made) was asked about the whole Die Hard legend. It turns out, that's all it ever was, because as he tells it, there is absolutely no way Commando 2 was turned into Die Hard. Here is what he had to say. "I don't know how this story started on the Internet - it's completely wrong. Die Hard is based on a novel called Nothing Lasts Forever by the author Roderick Thorpe, which is a sequel to his early book The Detective. In fact, a good bar bet if you want to make some cash is to ask someone, 'Who was the first actor to play John McClane and in what movie?' They will say, 'Bruce Willis in Die Hard' and you say, 'No! Frank Sinatra in The Detective!' and then run out before you get beat up. Interestingly, 20th Century Fox had to contractually offer Bruce Willis's part in Die Hard to Frank Sinatra because it was a sequel to the original book! Fortunately for Bruce, he said, 'I'm too old and too rich to act any more.'" So there you have it. Certainly, it was a fun idea to think that a sequel to one of Arnold Schwarzenegger's beloved action movies ultimately became the thing that made Bruce Willis an action star, in addition to probably being the single greatest action movie ever made. Also, by many accounts, arguably one of the greatest Christmas movies ever made. There is also the whole Frank Sinatra potentially playing the legendary John McClane in Die Hard thing. It is hard to imagine 20th Century Fox even moving ahead with the movie if for some crazy reason Ol' Blue Eyes had said yes. Luckily, he had no interest in being an aging action star ala liam Neeson. Commando was a very successful movie in its own right and one that many people still love. So that still leaves the question of Commando 2 and what actually happened with that movie. Steven de Souza did write a draft of the movie, which Frank Darabont did a rewrite on. He also discussed in detail what his version of Commando 2 would have been about, partially for fun, but also partially to further clarify that there is now way the movie could have been turned into Die Hard. Here is what he had to say. "So for Commando 2, we figured that Arnold, after blowing up half of Los Angeles, achieves some notoriety, retires from the army and, by the time the sequel occurs, is running a security firm. The plot would have seen him hired by a big corporation to oversee their security to protect their executives from being kidnapped, to stop people breaking into their building and to make sure their computers are secure. So he sets it up and hires the most dangerous people to be guards in the building and then lo and behold - he discovers the people he's working for are in the illegal arms business and the big corporation is simply a front. The end of the movie would see Jenny and Cindy, who is now a lawyer, trapped in the building and Arnold now has to defeat all the people he hired - all the meanest, toughest guards - as well as the security systems, the guard dogs, everything! So now, the awareness of Arnold Schwarzenegger trying to break into a building got conflated with Bruce Willis being trapped in a building. If there's something out there that resembles what Commando 2 was meant to be, it would probably be the recent Stallone/Schwarzenegger movie Escape Plan." 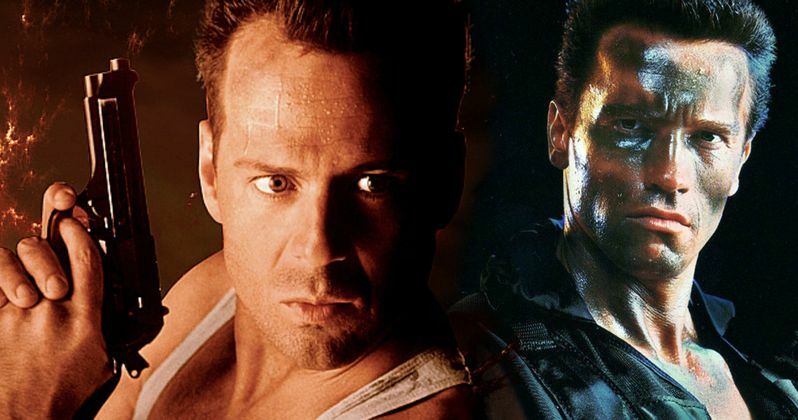 Commando was released in 1985 and Die Hard was released in 1988, so the timeline matches up with the legend and the plot of Die Hard, for the most part, seems like something at least structurally that could have worked for Commando 2. So it is easy to see where this whole thing could have come from, but it is now crystal clear that Die Hard was its own thing. Well, at least as a movie because it was based on a novel. Unlike Commando, Die Hard did have a sequel. 4, in fact, which went on to generate more than $1 billion at the global box office. None of the sequels ever quite matched the perfection of the original, some of which (mostly the latest 2) even soiled the legacy of the franchise in the eyes of many fans. At least now we can finally put this crazy Hollywood tale to bed.